Who doesn’t like to get a little bit messy? Our Messy Mayhem pack is perfect for those who want to celebrate with color! Take the fun outdoors, dress the kids in shirts that need some added color, and start the fun! 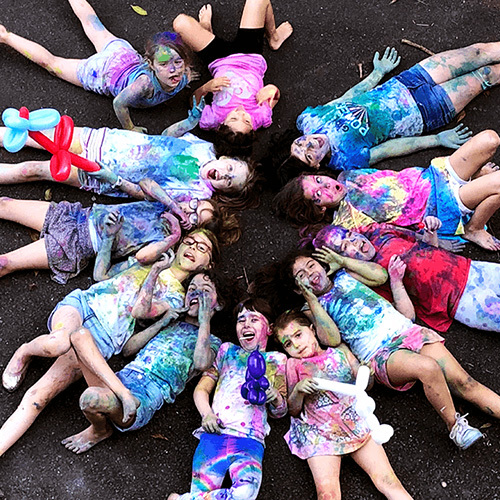 One or two super fun, colorful party hosts to play 3 messy colorful games and activities at a location of your choice (we recommend somewhere outside!). Colour Slime – Make and Play! How Does The Party Run? Our fun and experienced party hosts know exactly how to get the Messy Mayhem on! You just name the location (we recommend being outside, as it really does get quite messy! ), and our host(s) will be there with colors, props and energy. They’ll run all the games and activities, so all you need to do is have fun and relax. We recommend 1.5 hours for this party, which includes 3 Messy Games, but we can of course tailor the party to suit your child. All ages love to get messy! But we recommend this party pack for ages 6 to 12. Get in touch with Amazing today to plan your Messy Mayhem party. Request a booking, or to speak with an Amazing Concierge, call or inquire online.